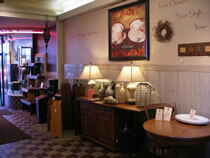 Ohio Amish furniture can be found in a number of places. All across the state, especially in the northern and central regions, there are clusters of Amish communities. In some of those areas, you can find little roadside stands where various Amish made wares are sold, including furniture, jams and jellies, baked goods and beautiful quilts. But while you are lucky to have stumbled upon these small stands, it is highly unlikely that you will be able to count on that same stand being in that same place if you come back, even one weekend later. And because of the unique nature of handmade, Ohio Amish furniture, that piece that you thought would be perfect in your dining room will certainly be gone, never to be seen in that exact perfection again. With Amish furniture, the rule should be to either jump while the option is there or do without. But you don’t have to do any of that if you are coming to Amish Originals Furniture Co. for your furniture needs. The cost of gas can mean that driving aimlessly through the Ohio countryside is not a realistic option for everyone. If you aren’t often in the area, there will be less of a chance that you are going to track down the furniture that you want to buy. If you do find the right furniture at just the right moment, what is the chance that you will be driving a truck on that day? You can’t ask the Amish to load up your furniture into their buggy and deliver it for you, after all. If you find the same Ohio Amish furniture at Amish Original Furniture Co., not only will you know that the piece you want is there, but you will also be able to arrange for quick and easy, local delivery. If you need delivery outside of the 20 mile range, you can make arrangements for that as well, at an additional fee. Regardless, you will save time and money by shopping for your furniture here. If you happen upon a piece of furniture and have the cash on hand to buy it plus a way to get it to your home, then by all means go for it, but if you are not that lucky, you are not completely without hope. Shopping for Amish furniture, at the furniture store Columbus Ohio, can take you back to simpler times, at least in one area of your house. One visit to Amish Original Furniture Co. online or in person can give you the ideas that you need to bring a room back to life, updating old and worn furniture with bright and shining, new, completely handmade furniture that is long lasting and attractive. There are pieces of every size, for every room in your home as well as outdoor furniture, so you are going to find the right piece, or better, pieces for the whole room.